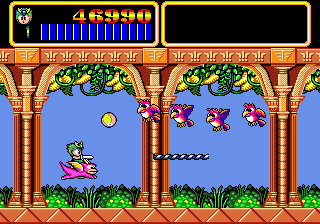 A port of the arcade game, Wonder Boy III: Monster Lair is the third and final coin-op in the chronologically-confusing Wonder Boy franchise. But what's not confusing is the clear attempt to merge its two arcade predecessors' styles into one product, all while aiming to expand on their ideas. However, it swings more in favor of the straightforward, side-scrolling mentality of Wonder Boy, the first game, than the emphasis on a slower-paced, adventure-like design of Wonder Boy in Monster Land, the second game. Examples include the first game's draining life/time meter, which has to be filled with food items constantly, not to mention the island, jungle, and cave backdrops also reappearing for the first three stages of Monster Lair. At best, Monster Land's "sword and sorcery" motif serves only as visual reminders, such as the two protagonists' knight and mage outfits and some familiar enemies. But instead of simply repeating the original Wonder Boy's outline with new graphics, the game adds some interesting layers to the formula. 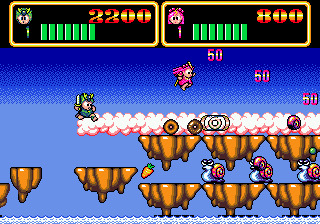 Every stage's first half consist of an auto-scrolling platforming segment, meaning you can accidentally get stuck in an awkward spot or fall in a pit if you get too distracted collecting fruit or killing off animals. Though, the second half of every stage is a surprising departure for the franchise: a horizontal shooting segment where you ride a pink dragon while fighting four-creature formations. 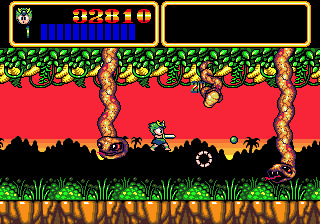 And if it wasn't obvious enough that Monster Lair really wants to be a shoot 'em up inside a Wonder Boy skin, limited-use power-ups are constantly falling out of destroyed enemies, such as destructive missiles and screen-filling spreadshots. There's even two-player co-op, the only game in the series to have such a feature. Weirdly, despite going through all this trouble of cramming in so many new features, the devs forgot to insert some fun into the game. Monster Lair is amazingly repetitive and boring. 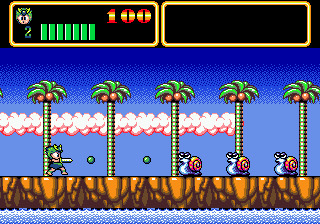 You'd think for being auto-scrolling platform sections, the first half of every stage would be challenging, but more times than not, enemies and hazards are just chores; ground creatures either charge your protagonist at a lax pace or just stay in place, both which can be defeated by your long-distance projectile attacks. Doesn't help that, at certain times in each segment, there's nobody or nothing on screen to combat. Meaning, if you want to make the auto-scroll go faster, you have to risk one-hit deaths by running your character up to the edge of the screen to push it forward, which is ridiculous. Seriously, only two of nine first half segments have any semblance of a real challenge, since they actually tried cluttering the screen at opportune moments, skillfully forcing you to dodge and destroy to survive. Even then, one of those stages, the desert, does it in such a cheap way to get you killed multiple times; high-flying, unreachable vulture formations have attack patterns that speedily force their entire gang towards your character, and ground opponents toss rapid projectiles that need to be dodged methodically, both enemy types being stressful if encountered simultaneously. Honestly, the greatest, genuine, and most consistent threat during these segments is, hilariously, acquiring the wrong power-up at ill-timed moments. That, and playing two-player co-op somewhat raises the stakes, since food items have to be shared or fought for to sustain both players' time meters. But all those problems are associated with the first half of every stage; the second half segments, the horizontal shoot 'em up parts, are bigger failures. The game just repeats one type of enemy formation for the duration of these segments, until a boss graciously appears to stop the monotony. Sometimes these formations appear at the top of the screen, sometimes they appear at the bottom, and sometimes they do a "fancy" spin before flying away... If that last sentence sounded dreary, then imagine experiencing this phenomenon for nine stages. The one time it's different is when stage eight's formations zone in on your current location at high speeds. It's not much of a divergence, but I was so shocked by this random burst of "creativity," that I accidentally lost a life at the start of the segment. I'm not particularly fond of the first Wonder Boy, mainly because it drags on a shockingly long time with limited material being repeated, but even that game did a better job engaging players. You can't abuse your projectile attack because it curves downwards, meaning you have to get closer with a lot of enemies, and when the screen doesn't have any opponents, it at least challenges you with platforming. Then there's the skateboard item that propels your character forward on its own... To this day, that skateboard still gives me anxiety when platforming. So, I just find it questionable that this second arcade sequel is somehow the inferior, jumbled release; like its only reason for existing is to fulfill some type of obligation or contract. But hey, at least Monster Lair's perplexing identity stays true to the franchise's overall confusing narrative. Just how confusing is Wonder Boy's chronology? A year after Monster Lair's arcade release, the console exclusive Wonder Boy III: The Dragon's Trap was released, and despite both games sharing the same main title, are completely different products with completely different play styles. Even more bewildering is how Dragon's Trap takes place immediately after the second Wonder Boy title, Monster Land, and that it's heavily implied that Monster Lair takes place after Dragon's Trap, despite being released prior. Which means, canonically, Monster Lair is the fourth Wonder Boy game. Don't even get me started on Wonder Boy in Monster World's Japanese title being Wonder Boy V: Monster World III, despite there never being a game labeled Wonder Boy IV. And the only game to harbor the term Monster World (I) is the Japanese Sega Master System (Mark III) port, and ONLY this port, of Wonder Boy in Monster Land... See how confusing this is??? If you enjoyed this Wonder Boy III: Monster Lair review, you're encouraged to discuss it with the author and with other members of the site's community. If you don't already have an HonestGamers account, you can sign up for one in a snap. Thank you for reading! Cutiest game!! Wonder Boy III: Monster Lair (Genesis). Im surely that my little brother love this game! Fantasteric review!! Wonder Boy III: Monster Lair (Genesis). Insert line of canned text that makes me sound human here! Seriously though. This is a good review. This game sounds like a beautiful mess, and that last paragraph did a great job of making me laugh. You just barely got bumped out of ROTW this week due to the fact that your review felt a little bit jumbled and hard to follow. Obviously that has a lot to do with the fact that this series is extremely jumbled and hard to follow, but either way, that was just the way the cookie crumbled this week. Great work overall, though. Thanks for the enjoyable read! Glad you enjoyed the review, and got a chuckle out of the ending. I can see why you would feel it's a bit jumbled in places, since I did throw a lot from other games in there when describing stuff. Thanks for reading. None of the material contained within this site may be reproduced in any conceivable fashion without permission from the author(s) of said material. This site is not sponsored or endorsed by Nintendo, Sega, Sony, Microsoft, or any other such party. Wonder Boy III: Monster Lair is a registered trademark of its copyright holder. This site makes no claim to Wonder Boy III: Monster Lair, its characters, screenshots, artwork, music, or any intellectual property contained within. Opinions expressed on this site do not necessarily represent the opinion of site staff or sponsors. Staff and freelance reviews are typically written based on time spent with a retail review copy or review key for the game that is provided by its publisher.